THE TORIES’ Highlands and Islands list MSP Jamie Halcro-Johnston has used a visit to Shetland to call on the SNP government to keep its word on delivering fair funding for internal ferry services in the Northern Isles. 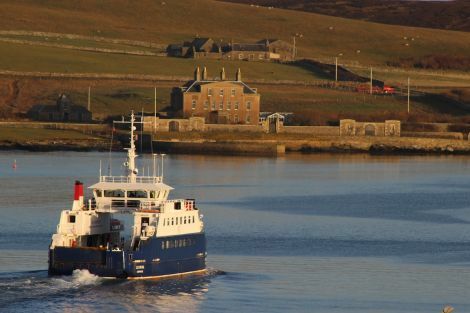 Shetland Islands Council – in common with its Orkney counterpart – spends millions topping up the funding it gets from the government to support internal ferries, unlike fully-funded services on Scotland’s west coast. Halcro-Johnston was due to meet council leader Cecil Smith, who recently raised the issue with government ministers in Edinburgh, on Monday afternoon. “We have a situation where the Scottish Government claim they want fair ferry funding, yet Orkney and Shetland are required to make a contribution to the cost of internal ferries that no other council in Scotland is required to do,” he said. The council estimates that it draws more than £7 million a year from reserves to support ferries between Shetland’s mainland and its outlying islands. Halcro-Johnston said the amount of money wasn’t huge in the context of the overall Scottish budget but “makes a big difference” in providing ferry services. The SIC has intimated that, without a fairer funding deal, it will be forced to consider cutting ferry services. The Conservative MSP said it wasn’t just a case of reducing services, but also reducing islanders’ ease of access “to healthcare, to jobs, to come onto the islands to work – so it has a big impact”. Halcro-Johnston said the SNP had “started politicking” by suggestion it was “up to opposition parties to really push” for a deal when the 2018/19 budget is going through. As a minority government, the SNP requires the support of at least one other party to get bills through Holyrood. “It has the power to remedy this any time it wants to, it’s choosing not to,” he said. Meanwhile, Halcro-Johnston also met agricultural and fisheries representatives on Monday morning. He said the fishing industry had enjoyed a “good, positive year with prices up, and quotas, and good export numbers”, and they were “still positive about the opportunities that Brexit will avail to Scotland’s fishing communities”. The MSP also praised the NFU for being “very proactive at looking at solutions post-Brexit”, although he acknowledge their approach was “more hesitant” about what leaving the EU could mean for crofters and farmers. Between January and May this year, of 13,400 seasonal agricultural workers recruited, just 14 were British – with the majority coming from Bulgaria and Romania. Some Shetland employers in the food processing and hospitality sectors have expressed concern about potential future difficulties in recruiting staff. Halcro-Johnston said he was not concerned by what that might mean post-Brexit because leaving the EU “allows us to put in place an immigration system that suits our needs”. But Todd responded that the amount of money people from outwith the EU need to be earning in order to work and live in the UK “makes it almost impossible” for many to settle in the Highlands and Islands under the present immigration system. “I just don’t have Jamie Halcro-Johnston’s confidence that the immigration system is fit for purpose, and I don’t think there’s a will to encourage immigration,” she said. Halcro-Johston also trumpeted a “very good budget” from Chancellor Philip Hammond last week, joining party colleagues in claiming it was the influence of 13 Scottish Tory MPs that ensured VAT will no longer be levied on Scotland’s police and fire services. That situation has persisted since 2013 when single police and fire services were created by the SNP. Nationalist politicians had been calling for parity with police and fire services for several years prior to last week’s announcement. But Halcro Johnston claimed that while “there’s been a lot of talk about the SNP MPs being ignored despite them raising the issue… my understanding is they never looked to have meetings”, whereas Tory MPs had been “proactive and positive” in obtaining change. Todd said that it was “appalling” that the UK Government wouldn’t listen to SNP and Scottish Government representatives and that it “reflects very badly” on the powers-that-be at Westminster. Halcro-Johnston said the issue of whether business rates are to apply to arms-length organisations in Scotland – a subject Shetland MSP Tavish Scott was vocal on during a recent Holyrood debate – was “another example of the Scottish Government coming up with a new policy… without actually having a look at how it impacts on different parts of Scotland”. If Shetland’s charitable trust-funded arts, amenity and recreational trusts are ensnared by the legislation – they are technically not ALEOs and argue they should be exempt on those grounds – it could cost them a combined £1.5 million a year. Meanwhile, he said delivery charges for parcels to the Northern Isles continued to be an issue frequently raised by constituents, as was the situation of parking at Sumburgh Airport which “just doesn’t appear to be working at the moment – there’s not enough parking spaces at peak times”.